I got my love of Nangka(Jackfruit) from Papa and Kaw Kaw. Mamarazzi not really crazy about Nangka but you know what fruit she is nuts about la. There was one time Mamarazzi bought a few packets of Nangka at the same time. Papa and me wallopped all. These are the seeds after we had finished with the pulp. "Kiasuism" striked Mamarazzi again. Such a waste if just throw these seeds away. What she did was she put these seeds into a pot of water, add a teaspoon of salt and boiled the seeds for 15 to 20 minutes or till they soften. Then she drained the water and pass the seeds to me. She said "EAT". For real? Can eat or not ah? Not bluff me is it? Hmmm...it turns out quite good. Taste something like Buah Berangan but not as sweet. Mamarazzi said some people also boiled durian seeds to eat leh...but I don't see her doing so. 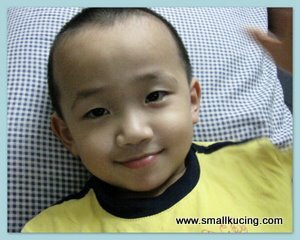 Nice kah? So far we only eat cempedak seeds.... After eating, kentut a lot! LOL!!! Hi SK, Wow! I have not seen these years! Love to eat them, with sprinkling of sugar. Your pics of food, fruits always wake up old memories in me. I love to eat the seeds too. Ya, this reminds me that last time my mum also boiled the nangka seeds to be eaten so as not to waste. 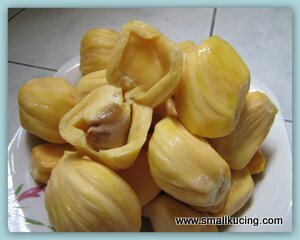 THe taste is so-so only, but very nutritious loh becos all the nutrients needed for a young jackfruit tree to sprout is all inside this seed. wah SK...baru auntie biji nangka pun boleh makan yeh...auntie selalu rebus biji cempedak..never try biji nangka...lepas ni bolehlah auntie try.. I so wish I could try that fruit, it looks so interesting! I know can eat like that, But don't really like the taste..
Nice! I ate quite a lot of nangka seeds when I was young. 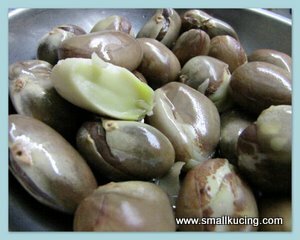 As for durian seeds, can slice it and deep fry (like the arrow root). I don't find it tasty though... very hard and flavourless haha. 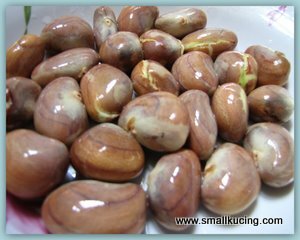 Durian seeds oso got ppl eat? I tot no taste no nutrients one wor? har tat seed can eat one ah? Alamak...makan nangka seed sure got letupan nuclear after that. Kentut will come alot wan worr! Yes the seeds can be eaten. But I don't like it..I prefer the fruit..yummy. Gwen also likes nangka. I do boil and eat the seeds, its very nice but my mum makes curry from the seeds or stir-fry with curry leaves, onion and some kunyit once boiled and sliced. didn't know nangka seed can be eaten.. but i miss those deep fried cempedak seeds, used to eat that last time.. These look yummy since I like boiled peanuts here...maybe not the same but the same idea?? By the way, after eating the seeds, perhaps you want to participate in this giveaway?